High arsenic (As) contamination of surface and groundwater occurs worldwide and irrigation with As-enriched groundwater is therefore the main pathway to accumulate significant amount of As into a number of crops and vegetable plant species, recent research suggests. The accumulation of As in plants occurs primarily through the root system and the highest As concentrations have been reported in plant roots and tubers. Therefore, tuber crops are expected to have higher As contents than that of other crops when those are grown in As contaminated soil as root system is the main parts of accumulate As in plants. Lead author Md. 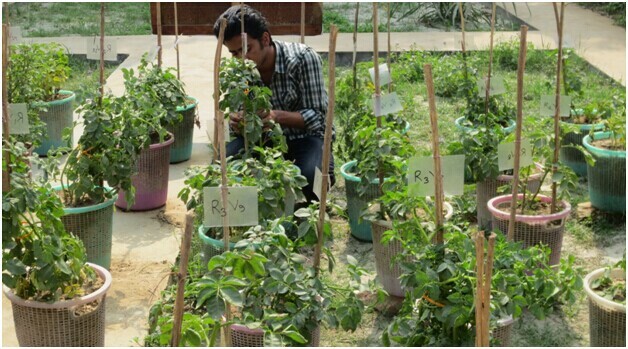 Nazmul haque, who conducted the research for his master's in response of some important Bangladeshi potato varieties studies at Sher-e-Bangla Agricultural University, Dhaka with different levels of arsenic contamination. Information was collected on: days to emergence, plant height, number of leaves plant-1, number of stems hill-1, stem diameter, leaf area plant-1, chlorophyll content of leaves and above ground stem dry matter content. Haque reported that duration of emergence increased with increasing As levels but 25 mg As kg-1 and 50 mg As kg-1 soil exhibited similar results. Plant height increased rapidly at the early stages of growth and rate of progression in height was slow at the later stages except 'Jam Alu'. The phytotoxicity at lower soil As concentrations was not significant. Stimulation of growth by As additions has been, however, reported to increase growth of potatoes. Growth of potatoes were not statistically affected up to 25 mg As kg-1 soil treatment compared to control but at higher concentration (50 mg As kg-1 soil) treatment chlorophyll content significantly decreased (Haque). Leaf area and number of leaves plant-1 increased with advancing growing period up to 75 DAP irrespective of As levels and thereafter decreased due to senescence of plant, Haque said. Number of stems hill-1 increased with advancing growing period up to 60 DAP irrespective of As levels and thereafter remained constant. Chlorophyll content (SPAD value) increased with increasing growing period up to 60 DAP irrespective of As levels and thereafter decreased due to yellowing of leaves. "The growth contributing parameters of potato are decreasing when As concentration was increased irrespective of varieties", Haque said. Though most of the growth parameters decreased with the increasing As levels but remained statistically similar up to 25 mg As kg-1 soil and thereafter drastically decreased. Among the potato varieties, "Felsina" showed superior growth performance compared to other varieties, irrespective of As levels. Additional co-authors were Professor Dr. Md. Hazrat Ali, Professor Dr. Tuhin Suvra Roy, Assistant Professor Sheikh Muhammad Masum, and Md. Nousad Hossain of Department of Agronomy, Faculty of Agriculture, Sher-e-Bangla Agricultural University, Dhaka, Bangladesh. The research was supported by grants from the Ministry of Science and Technology-Government of the People's Republic of Bangladesh. A paper about the study appeared recently in Journal of Plant Sciences.